Emma here. I am currently wading my way through the first months of college and trying to balance activism, school work, and extracurriculars. It’s tough! But Oak Flat is on my mind every day. My dorm room is adorned with “Save Oak Flat” signs and bananas, and each night before bed I light a candle in prayer for Oak Flat. 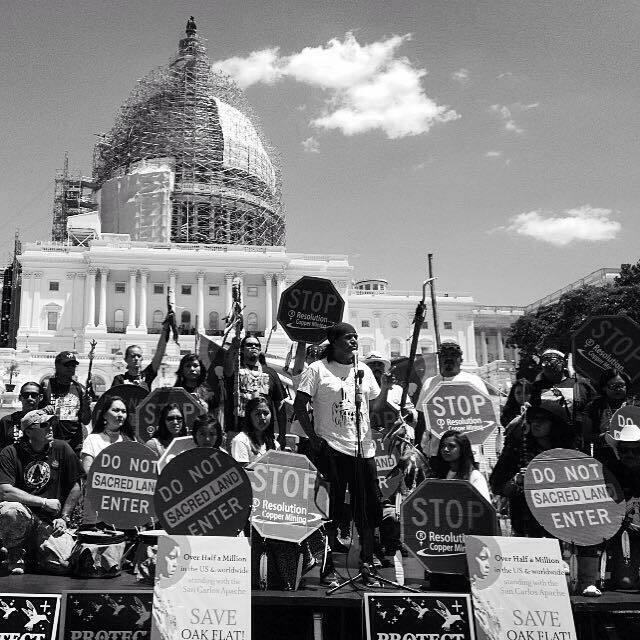 The taking of sacred land is an issue that affects indigenous people all over the country, and the world. I recently spoke briefly with Dr. Gwen Point, a member of the Skowkale First Nation in British Colombia, when she came to my school to speak. I asked her about protection of sacred sites in Canada. She told me that issues with the goverment trying to harvest resources off of sacred land persist in that country as well. Our walk instilled in me a passion for justice. With that in mind, I decided to enroll in a law class about American legal systems. One assignment we have is to pick a court case and research it, then report back to the class. I chose a case that I keep hearing snippets about in Indigenous communities, the case that changed everything for the religious rights of Native people. It is called Lyng v. Northwest Indian Cemetery Protective Association. This case took place in 1988, 10 years after the passage of the American Indian Religious Freedom Act. For those not familiar, this Act was based of the 1st amendment right to freedom of religion, and gave Native people the “inherent right of freedom to believe, express, and exercise the traditional religions of the American Indian, Eskimo, Aleut, and Native Hawaiians, including but not limited to access to sites, use and possession of sacred objects, and the freedom to worship through ceremonials and traditional rites.” On the surface this law sounds great. To me, it certainly sounds like it would protect sacred spaces such as Oak Flat. But the court case I’m about to tell you about changed all that. In 1982 the US Forest Service was creating a plan to construct a new road through the Six Rivers National Forest. This road would aid in the harvesting of timber in the area. But there was a problem. Native people said that this land was sacred. The Yurok, Karuk, and Tolowa Nations felt that development of a road and removal of trees would destroy the integrity of the area, a space where their people went to pray, hold ceremonies, and carry out traditional rituals. The Forest Service themselves even commissioned a study of the area that found that damage done to the land because of the road would be severe and irreparable to the sacred site. Yet just as the Environmental Impact Statement being carried out at Oak Flat has no teeth and no effect on whether the mine will be built, this statement had no power; the Forest Service decided to ignore the study’s findings and go ahead with their plans. The three Nations, joined by environmental groups and the state of California, filed suit. They hoped for an injunction that would prevent any further development on their sacred land. The District court agreed that this development violated their right to religious freedom, and issued an injunction. The Appellate court also agreed and upheld the injunction. Again, the Forest service appealed. The case was then brought before the United States Supreme Court. This Supreme Court Case changed everything. 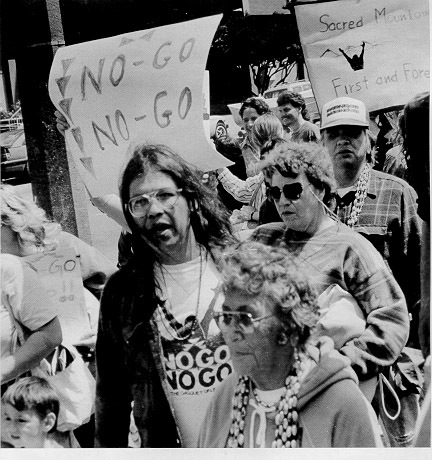 In a 5-3 decision the court said that “construction of the proposed road does not violate the First Amendment regardless of its effect on the religious practices of the respondents because it compels no behavior contrary to their belief.” The Court’s decision has had devastating impacts on Native people around this country; it essentially says that sacred sites are offered no protection if they serve some “greater” purpose (ie if they contain valuable resources) that the federal government desires. Not only is this decision incredibly destructive to the religious rights of first nations people, but the court’s reasoning is both illogical and offensive. They claimed that, “Whatever rights the Indians may have to the use of the area, however, those rights do not divest the Government of its right to use what is, after all, its land.” Yet the land in question was forcibly taken from Native people many years ago; Native people did not consent to the drawing of borders that transformed land that belonged to no one (and thus, everyone) to land that was federally owned. The opinion also stated that “this Court cannot determine the truth of the underlying beliefs that led to the religious objections here,” suggesting that the Native people involved in this case were simply making up the whole thing. This ridiculous notion is even more appalling in light of the fact that a study was conducted that proved the religious nature of this area. I would encourage anyone who has a few minutes to read the case for themselves. The dissenting opinion is incredibly eloquent and contains many intelligent points. Justice Brennan points out that “by defining respondents’ injury as “nonconstitutional,” the Court has effectively bestowed on one party to this conflict the unilateral authority to resolve all future disputes in its favor, subject only to the Court’s toothless exhortation to be “sensitive” to affected religions. In my view, however, Native Americans deserve — and the Constitution demands — more than this.” Brennan is right. This precedent that puts government interests over the rights of individuals is absolutely unjust and unconstitutional. It’s time for us to over turn this ridiculous precedent that creates a standard so low that sacred sites are offered almost no protection. I hope in my lifetime to see another sacred site case make it to the Supreme Court so we can reverse this decision. I hope in my lifetime the United States federal government will forge a new relationship with First Nations, one of mutual respect, and one in which they believe what Native people say when they call an area sacred. And I hope that we can come to a point at which everyone understands why we must protect and preserve the few untouched and natural spaces that are still left on this earth. Until then, I’ll keep working towards that goal. I think we’ll get there.